In a previous blog post, I told the story of how I used Amazon AWS and AlcesFlight to create a temporary multi-user HPC cluster for use in a training course. Here are the details of how I actually did it. Note that I have only ever used this configuration as a training cluster. I am not suggesting that the customisations are suitable for real work. A working AWS account. Ensure that you can create an EC2 virtual machine and connect to it via ssh. 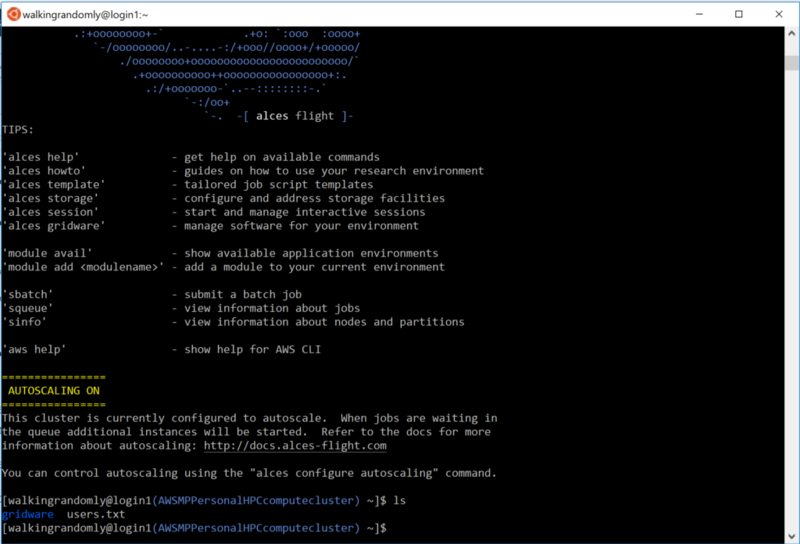 Get the AWS Command Line Interface working. 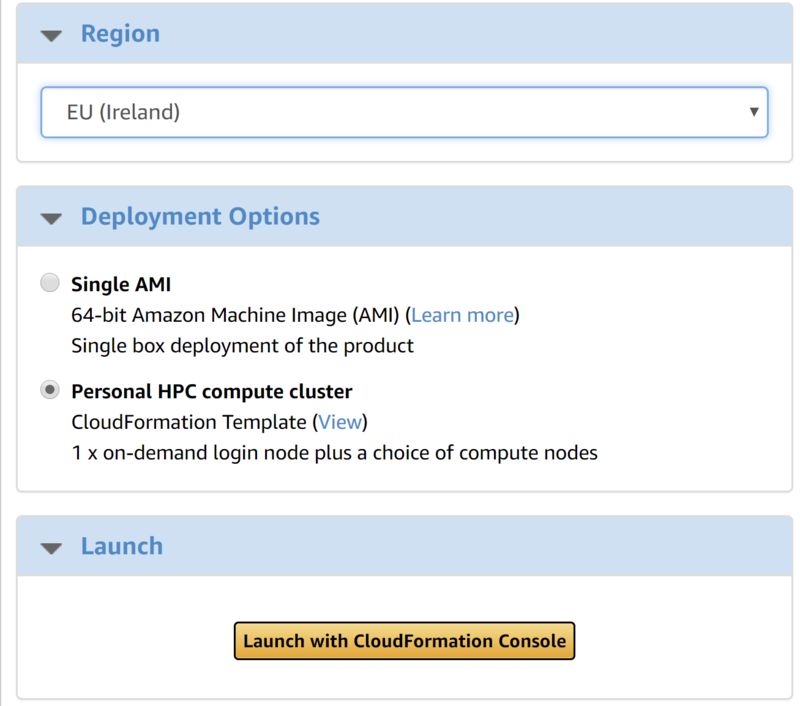 AlcesFlight provides a CloudFormation template for launching cluster instances on Amazon AWS. The practical upshot of this is that you answer a bunch of questions on a web form to customise your cluster and then you launch it. We are going to use this CloudFormation template along with some bash scripts that provide additional customisation. The first step is to get some customization scripts in an S3 bucket. You could use your own or you could use the ones I created. If you use mine, make sure you take a good look at them first to make sure you are happy with what I’ve done! It’s probably worth using your own fork of my repo so you can customise your cluster further. It’s the bash scripts that allow the creation of a bunch of user accounts for trainees with randomized passwords. My scripts do some other things too and I’ve listed everything in the github README.md. Go through the CloudFormation template screens, creating the cluster as you want it until you get to the S3 bubcket for customization profiles box where you fill in the name of the S3 bucket you created earlier. When the CloudFormation stack has been fully created, you can log into your new cluster as an administrator. To get the connection details of the headnode, go to the EC2 management console in your web-browser, select the headnode and click on Connect. When you log in to the cluster as administrator, the usernames and passwords for your training cohort will be in directory specified by the password_file variable in the configure.d/run_me.sh script. I set my administrator account to be called walkingrandomly and so put the password file in /home/walkingrandomly/users.txt. I could then print this out and distribute the usernames and passwords to each training delegate. This is probably not great sysadmin practice but worked on the day. If anyone can come up with a better way, Pull Requests are welcomed! At this point, I suggest that you try logging in as one of the training user accounts and make sure you can successfully submit a job. When I first tried all of this, the default scheduler on the created cluster was SunGridEngine and my first attempt at customisation left me with user accounts that couldn’t submit jobs. The current scripts have been battle tested with Sun Grid Engine, including MPI job submission and I’ve also done a very basic test with Slurm. However, you really should check that a user account can submit all of the types of job you expect to use in class. The log file at /var/log/clusterware/instance.log on both the head node and worker nodes is very useful. This is a classic dos2unix error and could be avoided, for example, by using the Windows Subsystem for linux instead of CMD.exe. One of the things that we do in Sheffield’s Research Software Engineering Group is host training courses delivered by external providers. One such course is on parallel programming using MPI for which we turn to the experts at NAG (Numerical Algorithms Group). A few days before turning up to deliver the course, the trainer got in touch with me to ask for details about our HPC cluster. Because Croucher’s law, I had forgotten to let our HPC sysadmin know that I’d need a bunch of training accounts and around 128 cores set-aside for us to play around with for a couple of days. In other words, I was hosting a supercomputing course and had forgotten the supercomputer. AlcesFlight is a relatively new product that allows you to spin up a traditional-looking High Performance Computing cluster on cloud computing substrates such as Microsoft Azure or Amazon AWS. You get a head node, a bunch of worker nodes and a job scheduler such as Slurm or Sun Grid Engine. It looks just the systems that The University of Sheffield provides for its researchers! You also get lots of nice features such as the ability to scale the number of worker nodes according to demand, a metric ton of available applications and the ability to customise the cluster at start up. …and I only bought coffee for myself and the two trainers over the two days! The attendees had to buy their own (In my defence…the course was free for attendees!). This gave me a cluster with between 64 and 128 virtual cores depending on the amount that the class were using it. Much of the time, only 4 nodes were up and running – the others spun up automatically when the class needed them and vanished when they hadn’t been used for a while. Worker nodes: $0.24 (ish) using spot pricing. Each one about twice as powerful as a 2014 Macbook Pro according to this benchmark. HPC cost: As such, the maximum cost of this cluster was $2.73 per hour when all nodes were up and running. The class ran from 10am to 5pm for two days so we needed it for 14 hours. Maximum cost would have been $38.22. The HPC cost was probably less than that since we didn’t use 128 cores all the time and the coffee probably cost a little more. To give a flavour, you can read about last year’s workshop here or look at the programme from last time.